The solar panels on our house mid-installation. We had to get our old place cleaned up and had no time, so we hired removals Bournemouth & Poole and let go of that load. Shortly after moving to Montreal City, it became fairly obvious that we’d need to do something about the power bill. The tiny rental townhouse we lived in for three months was constantly smacking us with $200+ bills and even our winter bills in the new house were over $350 each month. (We were even subtly warned by the Montreal movers, I overheard them say something about our heating system being crap, excuse my french.) With no basement, swamp cooler, or large shade trees, it was painfully obvious that something had to be done to slash our power costs. Switching to LED light bulbs, upgrading the thermostat to a complete new one I got at http://thermostatonline.com that can even control the temperature via WiFi, and setting higher temperatures than we were used to, of course you can check here for other brands, since there are picky people out there. As luck would have it, Southwest Applied Technical College (SWATC) was having a night about solar power back in February. They do training for solar installers like Evergreensolar.com and were able to explain who would or wouldn’t benefit from solar power, what kinds of systems exist, and what kind of costs you should anticipate. It was very informative and there were a few solar installers there to handle specific questions on what they do. When you run through it, solar makes a lot of sense. It’s also a very straightforward system to deal with. The big question about solar is “what does this cost ME?” And really, the answer is a giant pile of sticker shock to most people. 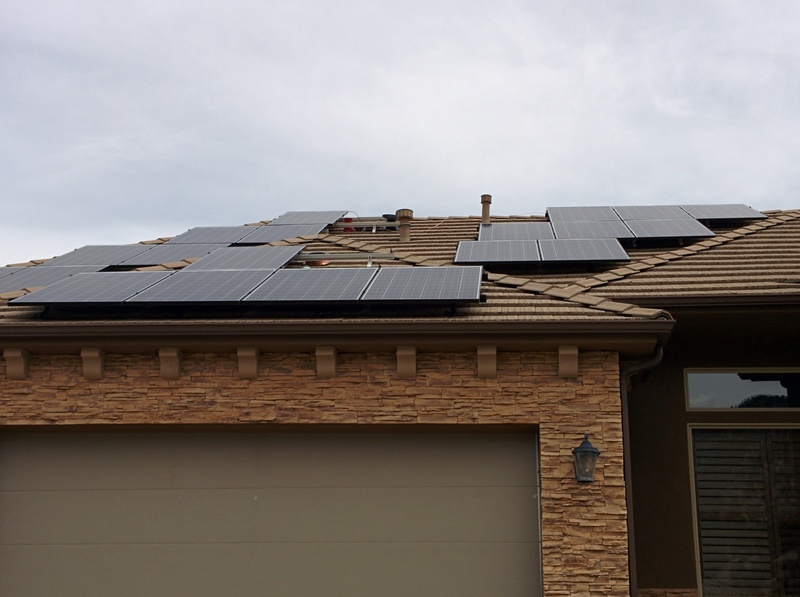 We did a 8.5kW system with string inverters for just over $27K installed. With such a high expense, you have to look at the long game to figure out if it’s worth it. First off, you get a lot of tax credits. The state of Utah does a 25% credit up to a maximum of $2,000. The federal government also does a 30% tax credit with no maximum. Both of these tax credits can be carried forward to future years if you don’t use them all in the first year. On our system, this works out to total tax credits around $10,100, just over 37% of the total cost. The general feel is that solar tax credits will be sunsetting Real Soon Now™, so now is a good time to act. Second, there are very competitive financing options available. We went with Admirals Bank and will be paying $313 per month over 7 years. Terms from 5 to 20 years are also available. Since it’s a mortgage, the interest is tax-deductible. The portion of the install covered by tax credits is due 18 months after taking the loan and accrues no interest during that time. We also have the option to re-amortize the loan within the first two years. The payments will be roughly our average power bill, but we’ll have an additional 23 years of power with nothing beyond the basic connection charge to pay to the power company. When we crunch all the numbers, we’re figuring that our power costs will drop around 80-85% over the 30 year life of the panels. It could be higher when factoring in rate increases and inflation. As a long-term proposition, it makes a lot of sense. 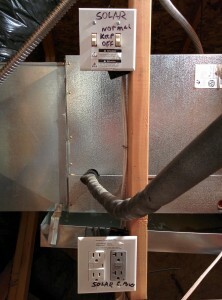 Outlets on two circuits we can use in a power outage with switches to toggle them. 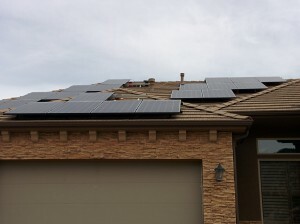 Our system included brackets and panels on the roof, a pair of inverters on the side of the house, and a pair of 15A emergency circuits we can switch to in the event of an extended power outage. Once the system is installed (it takes 2-3 days depending on the weather), it could take a week or two for Rocky Mountain Power to install the net meter. When it comes to inverters, you have two options: string or micro. 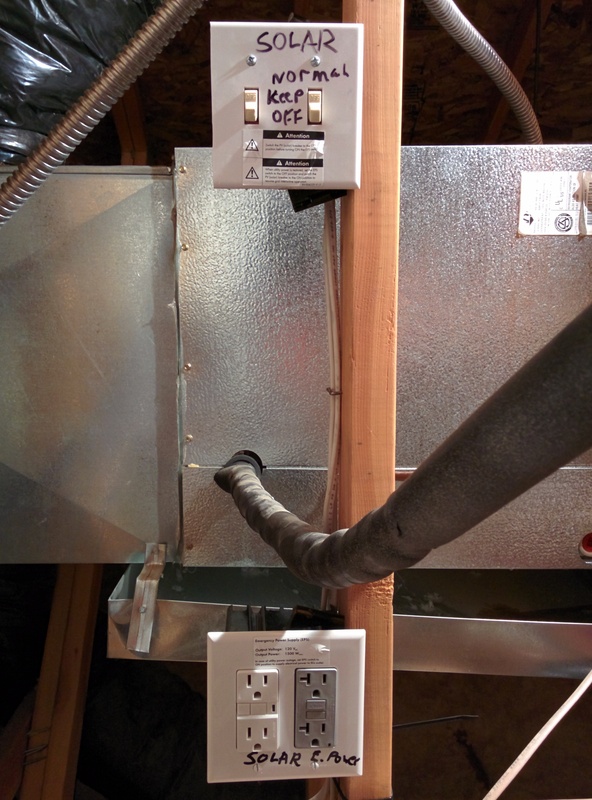 The string inverters are cheaper to install and result in fewer components to worry about. We have two of them for our entire system. The micro inverters cost more money and create more points of failure, but they also allow you to monitor every individual panel. 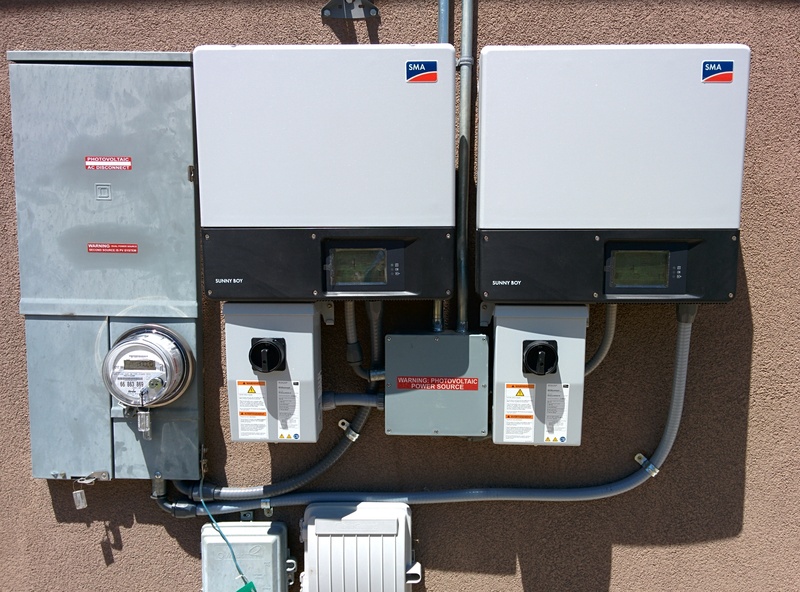 The string inverters we have installed have options for wired Ethernet, WiFi, or Bluetooth communication so that you can do your own monitoring and make an educated guess as to if a panel is having an issue, but someone will have to check each one. Even without any special network gear attached, the string inverters themselves track up to 16 days of power production on an hour-by-hour basis. The panel will also display the current output and total power produced over the day and life of the inverter. Checking it a few times per day shows that right now, during peak sunlight, we’re producing in excess of our usage about 13 hours per day. It drops to a trickle of power after sunset (just a few hundred watts), but it actually produces power from moonlight and starlight almost all night long. Cloudy days also still produce a few hundred watts. While full sun is obviously preferred (I’ve clocked a maximum output of 7.6kW), it’s nice to know that you’re at least getting something in non-optimal conditions. Of note is that the inverters we got came with a 10 year warranty, so expect to need replacements sometime during the life of the system. 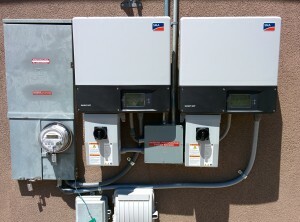 A pair of SMA Sunny Boy string inverters (right) next to the net meter (left). Net metering is a unique way to measure your power usage. It will keep track of how much power you produce in excess of what you use and how much power you use from the grid. You’re then billed for the difference. Rocky Mountain Power tracks total power production and usage on a rolling April to April cycle (the beginning of summer rates and the end of winter rates) so that high production months in the summer cover your usage in the low production months of the winter. They don’t pay you for any excess power you produce, but most of the utilities who do pay you a much lower rate than you will pay them. While we didn’t get one yet, a battery backup will store your excess production for off-peak usage and help prevent power outages. When you do net metering, the grid going down means the panels do nothing for you except through the emergency outlets, if you flip over to them. Most of the batteries on the market right now are lead acid. They’re cheap, fairly effective, and painfully heavy and bulky. If you have the space, they’re not a bad options. Tesla’s new Powerwall batteries are much smaller and lighter lithium-ion (the same thing your laptop, cell phone, and tablet use), but they don’t have much of a track record and can add upwards of $8k to the cost of your system for a 10kWh backup. In many cases, it’s best used as a supplemental backup for short outages with a natural gas generator for longer outages. The question everyone asks is “should I go solar?” If you have the money to pay up-front or can qualify for financing, have a location with good generation characteristics, and often end up hitting the Tier 3 rate in the summer, I think it’s a no-brainer long-term investment. If you don’t use as much power or don’t have a great place for panels (too many shade trees, not the right angle, roof facing the wrong way), it might still be a good long-term investment, but it could be much closer to a wash. Any solar installer (like Ron at Progressive Power) will take a look at your power bills to see how much you use and do a site survey to see how much you could reasonably generate. Previous story Eero makes big promises, but where’s the skepticism?